Located in Kyoto City and a 10-minute taxi ride (or 15-minute walk) from the west exit of Takeda Train/Subway Station, Hotel Grand Fine Kyoto Minami offers elegant rooms that include a flat-screen TV with free video-on-demand movies. This stylish property offers free parking and a 24-hour front desk with luggage storage. Free Wi-Fi is available at the lobby.Modern décor and warm lighting feature throughout the guest rooms at Hotel Grand Fine. All air-conditioned units are well equipped with a fridge, complimentary mineral water and an electric kettle with instant coffee. A spacious bathtub and toiletries are in the attached bathrooms. Guests enjoy the convenience of room service and vending machines. There are free-use internet PCs at the lobby. From nearby Takeda Station, Kyoto Station is a 10-minute train ride away and the Gion area is an 18-minute train ride away. Fushimi Inari Shrine is a 15-minute taxi ride from the hotel. 1.Take Kintetsu Kyoto Line from Kyoto station to Takeda station. It takes 5minuets approx. The fare is 210JPY. 2. 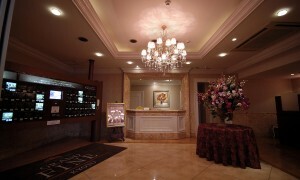 Take Taxi from Takeda station to our hotel. It takes 10 minuets. The fare is 800JPY to 1,000JPY approx. 1.Take Kyoto City Subway Karasuma Line from Kyoto station to Takeda Station.